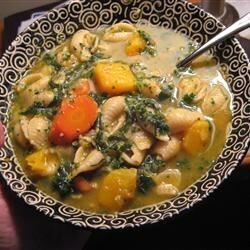 "A thick, creamy butternut and bean soup is loaded with colorful, tasty vegetables - potatoes, onion, carrots, and and kale. Serve with crusty bread." Heat the vegetable oil in a large Dutch oven over medium heat. Stir in the onion and garlic; cook and stir until the onion has softened and turned translucent, about 5 minutes. Stir in the carrots and butternut squash; cook and stir until squash begins to brown, about 15 minutes. Pour in the broth. Stir in the red potatoes, thyme, salt, and pepper, and bring to a boil. Reduce heat and simmer until vegetables are tender, about 45 minutes. Stir in the kale and great Northern beans, and simmer until the kale is tender, about 10 minutes. Pour about 3 cups of the soup into a blender, filling the pitcher no more than halfway full (you may have to do this in two batches). Hold down the lid of the blender with a folded kitchen towel, and carefully start the blender, using a few quick pulses to get the soup moving before leaving it on to puree. Return the pureed portion of the soup to the soup pot, leaving the remaining soup chunky. Alternately, you can use a stick blender and partially puree the soup right in the cooking pot. This soup was delicious. To make it easier I used one large can of pumpkin instead of the butternut and did not need to puree. It was thick and delicious and tasted even better the next day. It was really good. I chose not to puree the soup and i like d it better. Absolutely wonderful and full of flavor. Could not stop eating it from dinner time until 4:00 am for a snack. Will make again, many times!!!!!!!!!! !